Running to the gym? Headed out to do car pool? Maybe you’re setting off for that long-awaited afternoon on the town! 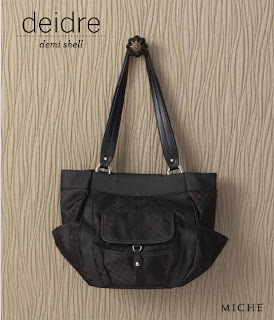 Diamond-patterned jet black jacquard and fashion-forward raven faux leather detailing makes the Miche Bag Deidre for Demi your perfect go-anywhere accessory. Roomy end pockets and chic snap-front mini-pocket add pizzazz.